It’s probably best to get your youthful indiscretions out of the way as early as possible, grow up, and get on with your life. Of course for some, coming back from the abyss never happens. Lucky for Social Distortion front man Mike Ness, he made it back alive. O.C.O.P. : Orange County original punks, Social Distortion, will perform their iconic self-titled third album in its entirety on Sept. 11 at Vina Robles Amphitheatre. Ness, 53, was kicked out of the house at 15 and started his punk band in high school. A self-styled rebel, he became addicted to drugs and alcohol and was in trouble with the law for fighting and heroin. His personal problems nearly destroyed his life and his band. 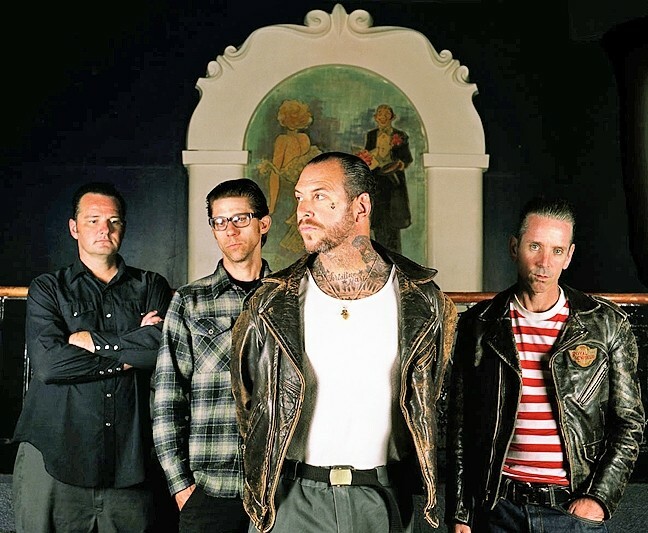 This Friday, Sept. 11, Social Distortion plays Vina Robles Amphitheatre, where they plan to perform their self-titled album from start to finish (7:30 p.m.; tickets at vinaroblesamphitheatre.com). Also expect to hear “classic tracks and rarities from their extensive back catalogue,” according to promoters. 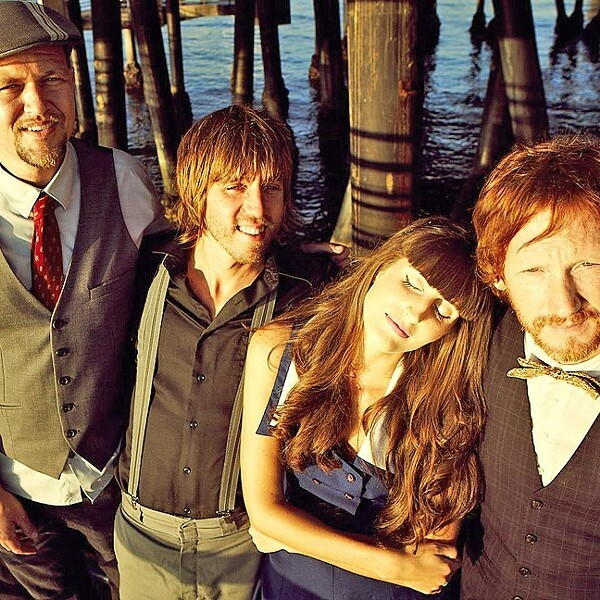 Nikki Lane and Drag the River will open the show. For your moshing pleasure, the show will have general admission pit tickets for right in front of the stage, where no seating will be provided, or if you’d rather sit back and enjoy the show, seating—including deluxe VIP boxes—are still available. As the old adage goes, what’s old is new, and playing into that desire for a fresh take on a retro sound is Leftover Cuties, who deliver jazzy pop songs that mix Dixieland, R&B, torch songs, and more—all played acoustically on upright bass, ukulele, banjo, trumpet, accordion, and more. RETRO DELUXE : The Leftover Cuties bring their jazzy retro sounds to Tooth & Nail Winery on Sept. 11. The band recently released their second album, The Spark & The Fire, in which they dive headlong into “love [that] makes the heart sing, soar, and ache … usually in the same song,” according to their bio. Featuring McAllen (lead vocals, ukulele), Austin Nicholsen (bass, vocals), Mike Bolger (brass, keys, accordion, vocals) and Stuart Johnson (drums, percussion, vocals), the band can transport you to a smoky cabaret, an underground speakeasy, or a backwoods juke joint, with music driven by McAllen’s sultry vocals. FULL BLUHM: Nicki Bluhm and the Gramblers bring their sunny, breezy rock to SLO Brew on Sept. 12. Nicki Bluhm and the Gramblers play the Brew on Saturday, Sept. 12 (8 p.m.; all ages; $15 presale or $17 at the door). Bluhm has tapped into a vintage rock and country soul sound that could have come out of Laurel Canyon in the ’70s. Groomed for greatness by her now-husband Tim Bluhm of The Mother Hips, who “discovered” Nicki singing an impromptu blues songs at a New Year’s Eve party, she’s grown into a seasoned performer with a Dusty Springfield vibe. Girls + Boys opens. Tumbleweed Wanderers roll in to SLO Brew on Tuesday, Sept. 15 (7:30 p.m.; all ages; $10 presale or $12 at the door). The Oakland-based band got its start busking outside Bay Area venues, creating street performances on a mandolin, banjo, guitar, washboard, and trashcan kick drum. Playing a mix of soul, folk, and rock, the quartet has an intimacy and immediacy that’s infectious. Finally, SLO Brew hosts Whiskey Myers this Wednesday, Sept. 16 (7:30 p.m.; 21-and-older; $15 presale or $18 at the door). According to their bio, “Whiskey Myers make honest music. Loud and proud, they sing about what they know with a refreshing directness and clarity. Some call it rebel music, but it’s more like everyday soul. Their songs are stories, with characters and situations that are immediately relatable. Stories of celebration, of mourning, of trials and triumph.” If you like Lynyrd Skynyrd or the Allman Brothers, this is your band. LEGEND: Jim Messina of Buffalo Springfield, Poco, and Loggins & Messina plays the Clark Center on Sept. 12. 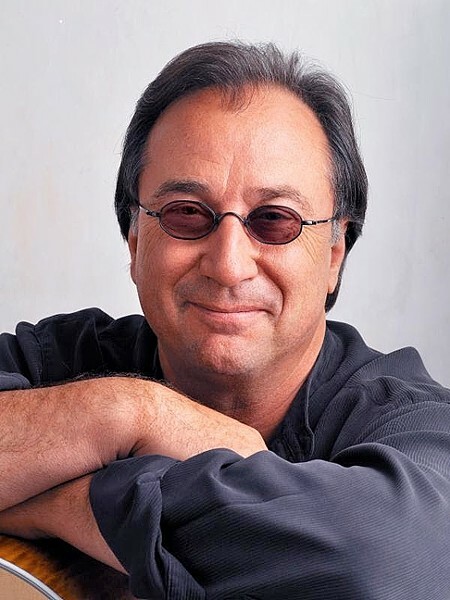 Buffalo Springfield, Poco, Loggins & Messina—these are legendary rock acts that all have one thing in common: Jim Messina! The singer-songwriter, producer, and engineer was a key contributor to Buffalo Springfield in the ’60s and ’70s, was co-founder of Poco, and made up one half of his famed duo with Kenny Loggins. This Saturday, Sept. 12, Jim Messina and special guest Rusty Young play the Clark Center (8 p.m.; all ages; call 489-9444 or visit clarkcenter.org for tickets). Born in California and raised here and in Texas, he picked up the guitar at age 5 and started working out parts in Elvis and Ricky Nelson records. Soon he was influenced by surf rock and formed his first band, Jim Messina & the Jesters in high school, playing music in the vein of The Ventures, Freddie King, and Duane Eddy. He’s credited with songs such as “Follow Your Dreams,” “Look Within.” “Lovin’ You Every Minute,” “The Island,” “Stay the Night,” and many others. Shadowlands brings its gorgeous and mysterious sounds to Biddle Ranch Tasting Room this Friday, Sept 11, at 5:30 p.m. The band’s debut album is in the running for Album of the Year at the New Times Music Awards, on Friday, Sept. 25, at the Fremont Theater. Put that on your calendar! ROCK GODDESS: Kristen Black puts her band through their paces on Sept. 11 at D’Anbino Cellars. D’Ambino Cellars and Steve Key of Songwriters at Play has a hot show cooked up for this Friday, Sept. 11, when local singer-songwriter Kristen Black shares the bill with North Carolina duo the Stringtown Ambassadors (7 p.m.; 21-and-older; $12; call 227-6800 for tickets). Black will be backed by Steve Conrad (guitar), Geert De Lange (bass), and Daryl Vandruff (drums). “We’re going to rock out!” she said. The Cliffnotes, featuring ex-Big Brother & The Holding Co. lead singer Valerie “Fireball” Johnson, will bring their acclaimed mix of boogie blues and swampified rock to Poalillo Vineyards this Saturday, Sept. 12, at 6:30 p.m. (limited $20 tickets include your first glass of wine and dessert, available at brownpapertickets.com/event/1413808). Aside from that dude Brian Monzel, HOT TINA is nearly an all-grrl act, with Alexandra Wenzl, Shea Kelly, Rose Hall, and Hannah Slobotnik. They’re basically a smokin’ hot punk rock band that will remind listeners that yes, rock ’n’ roll can still be that dangerous thing your mother warned you about. The band plays Brews and Bites in the SLO Mission Plaza on Saturday, Sept. 12, at 11:45 a.m., Bang the Drum Brewery on Friday, Sept. 18, at 7 p.m., and the Morro Bay Harborfest on Saturday, Oct. 3, at 4 p.m. “We recently recorded a demo that can be downloaded at https://hottina.bandcamp.com/ and we have plans to record an album this winter,” Wenzl said. 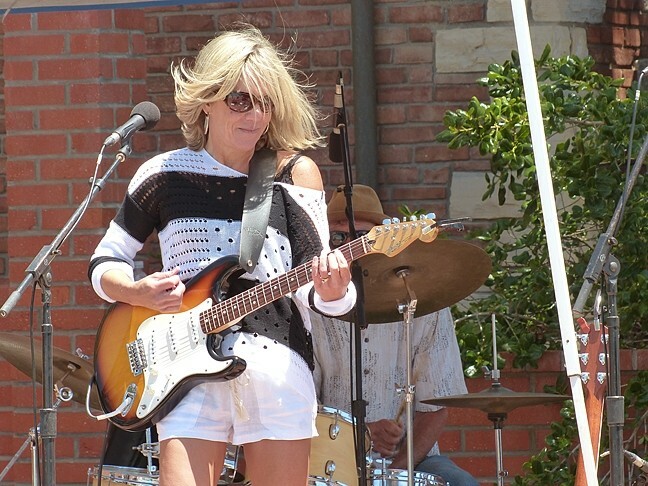 Back Bay Betty plays Sunday, Sept. 13, at The Morro Bay Avocado and Margarita Festival (714 Embarcadero) from 10:30 a.m. to 1 p.m. delivering originals, classics, and funky blues. Entry is $5, which includes a raffle ticket to win a year’s supply of avocados! HOT, HOT, HOT! 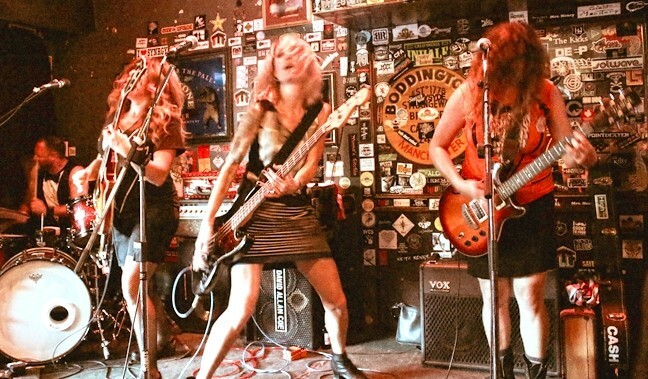 : HOT TINA plays Brews and Bites on Sept. 12 and Bang the Drum Brewery next week on Sept. 18. To celebrate the release of her new album, Wind Over Stone, singer-songwriter Dulcie Taylor will headline and emcee the Arroyo Grande Concert in the Park this Sunday, Sept. 13, from 1 to 5 p.m. in the Rotary Bandstand. Called “Duets from the Heart for the Heart,” the concert will featured duets by Taylor & George Nauful, Tim Jackson & Debra Windsong, and Ted Waterhouse & Karen Wilkins. Bakersfield-based blues, alt, and rock act Western Medicine plays Frog and Peach this Sunday, Sept. 13, (10 p.m.; 21-and-older; free). “Biographies are really hard to write; everything comes out like a book report no one wants to do. To keep it short, we are two buddies who try to blend all of our styles into the most enjoyable ear candy we can make for you,” their bio reads. SLO Strummers present The Quiet American, featuring Aaron & Nicole Keim, this Monday, Sept. 14, at the SLOMA, when the duo presents a ukulele workshop and concert of old-time American songs on acoustic instruments (6 to 9 p.m.; $20 tickets at sloma.org/events). Bring your ukulele! It’s still a week out, but you should put Beaverstock on your radar for Saturday and Sunday, Sept. 19 and 20. The annual music festival at Castoro Cellars has developed into a don’t miss event, with great musical acts and a comfortable atmosphere. This year they’ve expanded with a visual arts area dedicated to local craftsmen, workshops, yoga, and more. “Much more than a music festival, Beaverstock is an experience, a place to be inspired, relax, dance, create, and bring the family. The gathering of our beautiful community, the unique local craftsmen, and sharing the Beaverstock experience is what makes the festival unlike any other on the Central Coast,” said Max Udsen, special projects manager for Castoro Cellars and co-founder of the festival. There’s plenty of great food and drink available, and of course the music: On Saturday, see Dawes, the California Honeydrops, SambaDá, The Bills, and The Tipsy Gypsies; on Sunday see La Santa Cecilia, Birds of Chicago, The Brothers Comatose, The Mother Corn Shuckers, and WAR. The Stompin’ Grounds stage features local favorites The Turkey Buzzards, One Time Spaceman, Bear Market Riot, Chris Beland, and Guy Budd with Inga Swearingen. All the proceeds from the festival go to the Templeton Education Foundation (TEF), which benefits Templeton Public Schools. Two-day tickets are $70; visit www.castorocellars.com or email events@castorocellars.com or call 238-0725 for info and tickets.